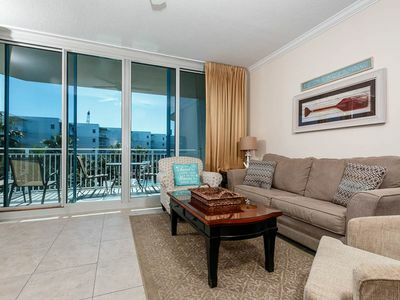 This spacious condo with 1,279 square feet features a Nautical theme with nautical accessories, crown molding, chair rails and wooden floors in the living room and Master Bedroom. Other upgrades include 42' high definition TV (1080P) with Blu-Ray/Wi-Fi connection (Movies via Netflix available) in living room with convertor cable box providing a full range of wide screen high definition channels. You'll enjoy movies, sports and your favorite shows broadcast in true High Definition on large TVs. There is a 32' Hi Def TV with Blu-Ray/WI-FI (Movies via Netflix available) in the Master, 22' Hi Def TV with a DVD in the Bunk room and a 36' Hi Def TV with Blu-Ray in the guest room. 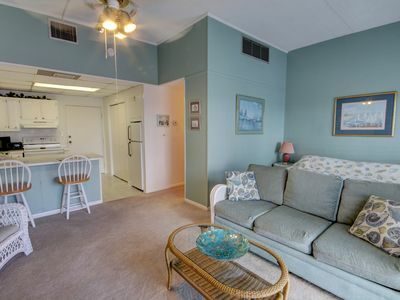 There is plenty of comfortable seating with a sofa, love seat, occasional chair, dining table that seats six and three bar stools at the breakfast bar. 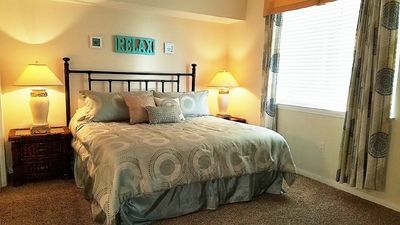 There are sleeping arrangements for up to eight people with a king sized bed in the master, a queen sized sofa bed, a queen sized bed in the guest bedroom and bunk beds in the Kid's room. The Nautical theme appeals to the boater in all of us! 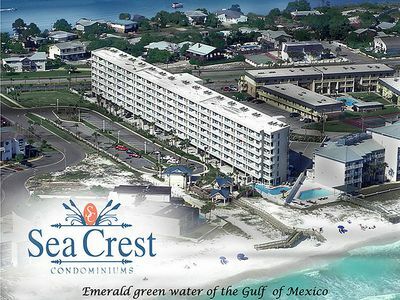 Have you ever dreamed of yachting or sailing the Gulf of Mexico? 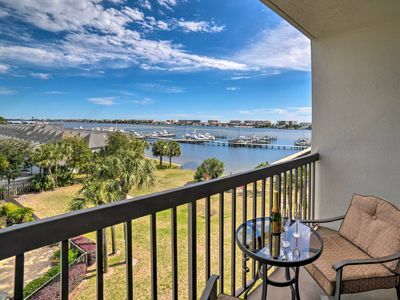 Maybe your idea of the perfect vacation is watching the boats sail by! Sunsets, lazin' in the sun, golf, fishing, listening to Jimmy Buffett? 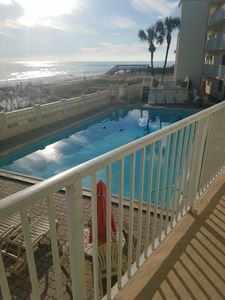 All this and more is awaiting you in this beautiful condo! 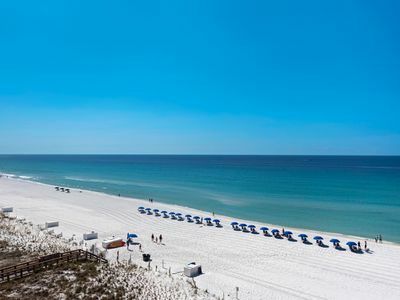 Visit Gulfside #408 and enjoy this crisp, vibrant and All American Nautical theme! 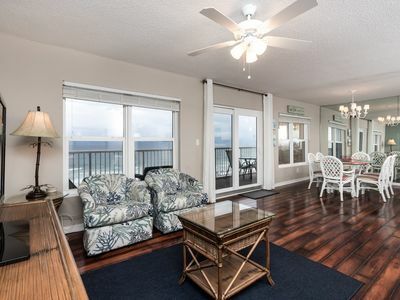 This fourth floor location is ideal for the best beach views! 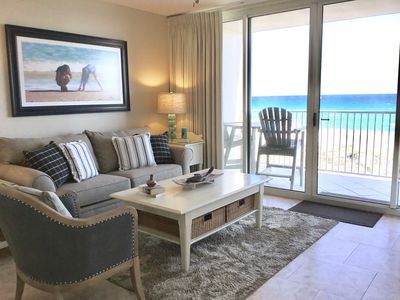 Sit back and relax with your Margarita on the balcony or sofa and watch the dolphins play! 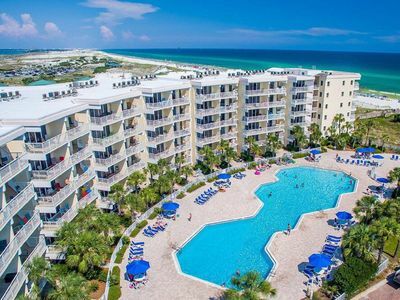 Destin West Beach and Bay Resort has the most amenities of any resort along the beautiful emerald coast! 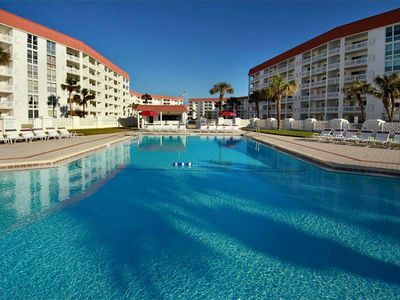 Enjoy the sparkling white beach and emerald green waters or relax by the huge lagoon pool. Treat yourself to a soothing swim in the heated pool or unwind in the jetted whirlpools. Kids will delight in the splash garden and kiddie pools. 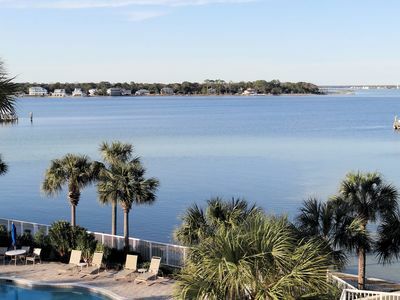 Take the Sky Bridge to the Bayside and float down the lazy river in a bright yellow tube. There is also a zero entry pool to enjoy and a waterfall to rejuvenate your spirit. The bay is right there for swimming, fishing, crabbing and windsurfing. Grills and picnic areas are provided for family cookouts. 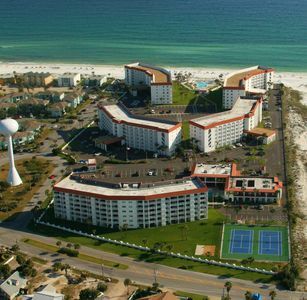 For fitness buffs you'll discover a beachfront fitness center with the latest equipment. 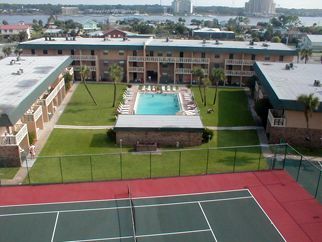 Within a quarter mile is the boardwalk with numerous restaurants and shopping. 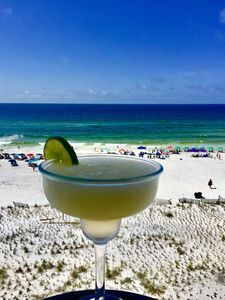 Within four miles you'll find Destin's beautiful harbor offering charter boat fishing, dolphin cruises, sunset sails, casual and elegant dining. Close by you'll discover numerous golf courses, award winning shopping venues with numerous dining options along with many movie choices. Islander 2-6002 - Booking spring vacays, now! Waterscape B426 - Spring availability – won’t last long! 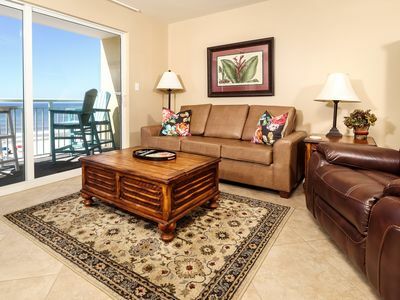 Great Unit, Two Bedrooms, Private Balcony - Enjoy! 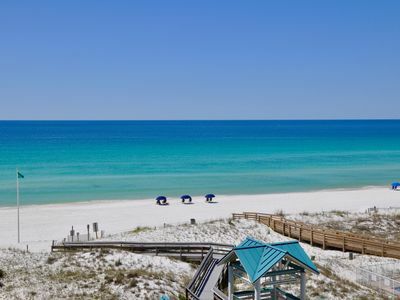 Beautiful Gulf-front vacation rental W/spectacular view of the Gulf of Mexico! 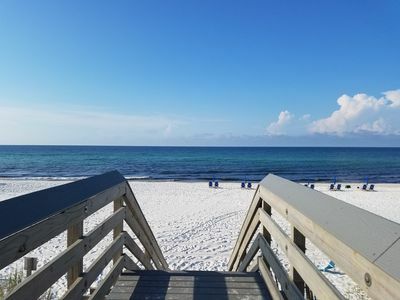 Beach getaway! 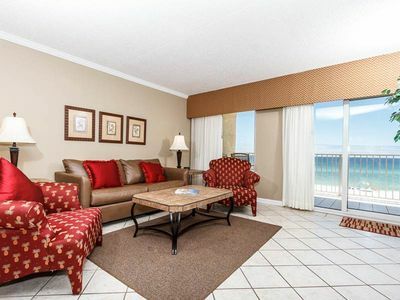 2 bed 2 bath condo ! PET FRIENDLY. 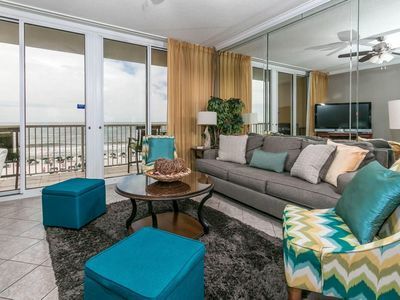 2nd floor unit! On Beach!!! NEW! 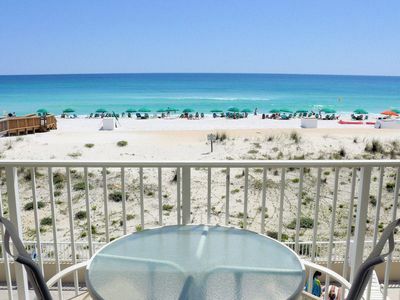 Fort Walton Beach Studio w/Pool Access!